We've been chosen as one of the finalists in the About.com Reader's Choice Award for best Herbal Magazine, and it would be great to win. 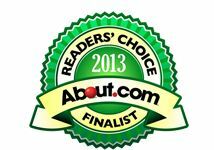 If you love The Essential Herbal - please cast a vote for us - or if you have another favorite, give them a nod. You may vote daily until March 17th and I'm placing the link on the top right of the blog so it's easy to find. Thanks in advance! Strangely enough, right around when the groundhog predicted the end of winter, along came winter. As is seeming to be becoming the norm, November and December were mild, with February giving us the only real burst of winter we've gotten here. Still, I expected to wake up to spring the day after Groundhog Day. Just a little bit. When I was a child, I believed it with all my heart. For the first few years after being aware enough to know about the groundhog, it was my belief that somehow man had screwed up the works. Somehow no matter how many times the groundhog said spring was here, I never doubted him. No... somebody messed it up. Back then, we wouldn't see bare ground or grass for months on end. Seasons didn't merely drift by, they arrived with a firm and determined progression and stuck around until the next season just as firmly eased them along. This is not the raving of some addled old codger (although whether or not that is an apt description is up for debate); it really was that way. I still look outside immediately on Groundhog Day, hoping for an overcast sky so that he won't see his shadow. Part of me still believes. Now it's beginning to look like we might need to add a fifth season. The plants haven't caught up with this shift yet, so they have a practice run and start greening up very early. In fact this year that was happening before this February blast, so maybe it should be super pre-spring, pre-spring, and real spring. The tricky part for the plants is coordinating the weather with their blooming and fruit-setting. They had a very difficult time last year. The cherries here on the farm hope to do better this year. Today I woke to sunshine and blue skies in the bedroom windows. It's been weeks since it seemed like a good time to wander around outside, so I did a wee bit of looking around out there while the coffee brewed. Things are starting to happen out there! They may have to start over, but for now, they're starting to get geared up. All of the fruit trees have swelling buds on their branches. The conifers have been busy releasing their cones to the winds, preparing to start up pollen production. There's a lot going on as they stir in their sleep. Blueberries are taking off now that they're fenced in. Lots of weeds though! Slim pickens for the birds over in the echinacea patch. The beautiful Concolor fir on the corner of the yard will soon burst with new tangerine and piney scented growth. Brave elderberry pushing tiny leaves. Might have to start over, though. Let's not have a replay of that bad harvest from last year! That was pretty devastating. There is so much work to do here. I mustn't waste a single beautiful day. Rosemary is covered with flower buds. She seems to do fine flowering in cold weather though. The Witch Hazel that was hounded mercilessly by both rabbits and groundhogs finally got a foothold when I protected her with flexible spouting one year. Now you wouldn't know her first three winters were spent being nibbled to the ground. She's nearly 5' tall. This is going to be a big problem. These black raspberries have been dug and transplanted a couple of times now, but they really, really just want to hug the side of the house and grow up through the slats of the front porch. They have wicked thorns though, so they may not stay there. Just looking at the things that need to be started on the first warm day - digging up the vigorous sumac and mulberry volunteers, clearing the blueberry patch, figuring out what to do about the wild raspberries and on and on - makes me feel like we've only got a few more weeks to go. Even the groundhog needs to get with the program. It's always exciting to announce a new issue and share the table of contents, but especially as we pass the darkest days of winter and start heading into spring. Winter is fine mind you, but as plant-lovers, we are all about longer days, sunlight, and warming earth. It is a great pleasure to post this issue. Kristine's beautiful cover is the very essence of what we're waiting for. The lush colors and plants surrounding her daughter evoke the spring so clearly that I can almost smell that first bare-foot day that has the edge of a chill to it. 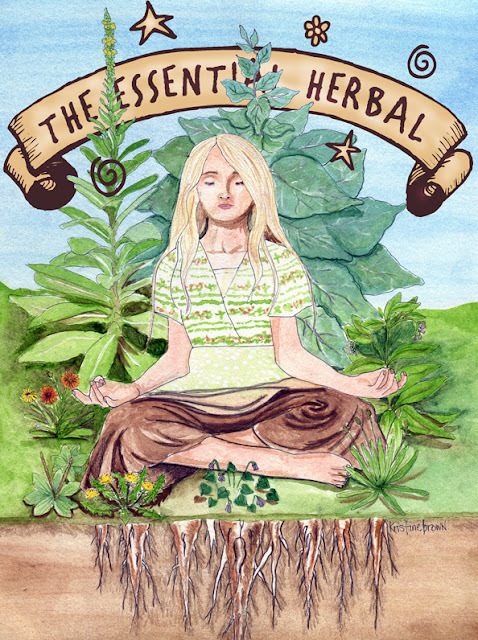 The articles are a wonderful variety, with a good dose of both herbal history and growing information. Lots of information and recipes - it's another keeper! They're starting to arrive in subscribers' homes now, and we always make sure to have plenty printed so that you can subscribe at any time and receive this issue until it's time for the next one! To subscribe, visit www.essentialherbal.com - easy as pie. Itching to use some fresh herbs? So are we! Kristine, who writes and illustrates her own beginner's herbal magazine, Herbalrootszine.com, graciously agreed to do a spring cover for us. She explains her inspiration. 4 great recipes to get you started on a more healthy and natural home cleaning habit. Think you know all about Queen of Hungary Water and Four Thieves' Vinegar? You might just be surprised. What is it, how do you grow it, and what about harvesting and storing? Find out here, and then make up some salsa using her simple recipe! Need some whimsical new ideas for small space gardening? You'll love the ideas and photos Marcy shares in this article. Just how does one keep a castle tidy? Prepare feasts? Care for the sick? Beautify one's visage? Not exactly the good old days by any means, but surprising how much will sound familiar, herbally speaking. Marci made this stunningly beautiful soap, and upon seeing it I asked for an article. She started at the very beginning of the process and takes us all the way through. Get those seeds going so you'll be ready as soon as your final frost date passes. Nuggets of information on the lore and use of various herbs and spices. Do you know what was hung on the door at night during the Middle Ages to repel evil spirits? You will. Delectable herbed chicken dish that includes everything for a meal, all together. We never know when a natural disaster might send us scrambling for herbs to use medicinally in first aid. Suzan discusses what we might want to have on hand to stay as healthy and de-stressed as possible. It can be daunting to start big with herbs. Much better to start with something that we can easily manage and go from there. Perfect solution? A half-barrel (or something similar) is just right. Is beekeeping for you? Delores honestly shares what she's learned, both good and bad. Besides looking beautiful (especially after a rain), what the deal with Lady's Mantle? Early spring still holds the threat of colds and flu. Here's a terrific tea recipe to get you through. 40 plus years of Reppert marketing wisdom tells Susanna that the times, they are a-changing and she's up to the challenge. A couple recipes and tips for use and storage. You could spend a fortune on a jar of herbal salt scrub OR you could whip it up at home for a fraction of the cost (and a lot fewer additives). Hmmm... tough choice!